Cycle in style with the 18 Inch Miami Bike! Whether you’re riding to the park with friends or cycling to the shop, this bike will look great as it gets you there. Super smooth and sleek, the 18 Inch Miami Bike features a strong steel frame that’s designed to last. The striking sky blue of the frame is continued on the bicycle’s comfortable saddle and textured handlebar grips. The saddle is even printed with a cute pink crown icon! Contrasting bright pink mudguards help to protect you and your clothes from splashes while cycling. The half chain guard and frame are printed with ocean-inspired designs to complete the colourful Miami theme. The half chain guard also covers the part of the chain closest to the cyclist in order to protect them from scrapes or grazes should their foot slip from the pedal. 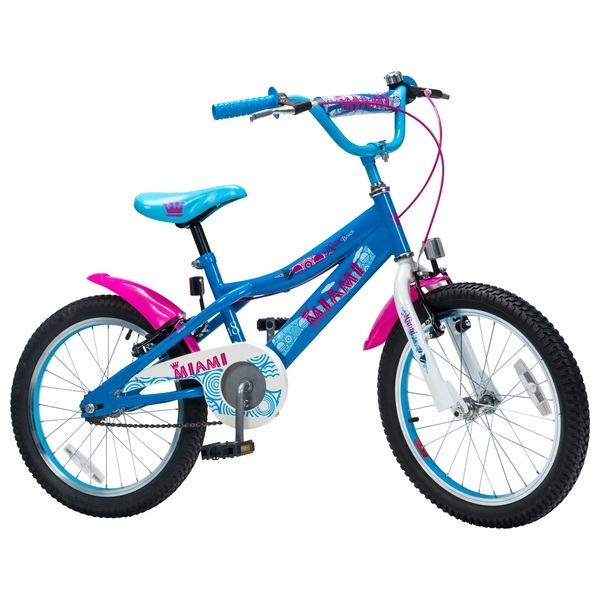 The 18 Inch Miami Bike is equipped with V-brakes, featuring a direct pull mechanism for the safety of the cyclist and bright pink brake cables that add a splash of fun. The fixed gear siplifies cycling for an easier ride, while the bell makes sure that you can be heard by others when you’re out and about on the 18 Inch Miami Bike.